World Champion Evan Lysacek felt his short program was better at Skate America on Friday in Lake Placid, N.Y., than two weeks earlier at the Cup of China in Beijing. “I felt I performed the program better than I did at Cup of China,” he said. The scoreboard told a different story. Skating in front of a receptive home crowd that awarded him with a standing ovation, Lysacek received 79.17 points, less than the 80.80 he scored in his season debut, but he still easily won over France’s Florent Amodio (72.65) and American teenager Brandon Mroz (71.40). 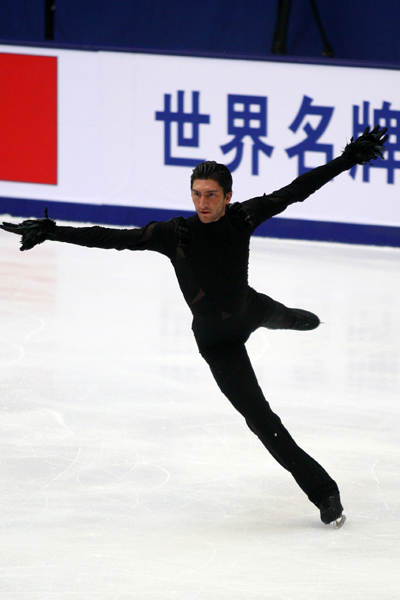 Interpreting the music of Igor Stravinsky’s Firebird, Lysacek had trouble on the first element of his program, the triple Axel, which he received a downgraded on for under rotation. The two-time U.S. Champion easily put the problems behind him to land a solid triple Lutz-triple toe combination and a triple flip. He finished with his trademark step sequence and a Level 4 spin. In China, he received a deduction for the wrong take off edge on the triple flip. Amodio treated the Lake Placid crowd to his best performance ever, according to coach Bernard Glesser. The Frenchman landed a strong triple Axel, nailed a triple Lutz and then performed a triple Salchow-triple toe combination, helping him to the second highest technical element score of the evening. Mroz won the technical mark for a program that was dramatically different than the one that left him in last place after the short program at Rostelecom Cup in Moscow, Russia, earlier this season. Skating to a Latin song “Temptation,” he was credited for the quadruple toe-triple toe combination, although he turned out on the landing of the first jump, and later made the same mistake on the triple Axel. “I just want to rock it in the long,” Mroz said. The men’s free skate starts at 8:57 p.m. local time on Saturday. Former U.S. silver medalist Ryan Bradley, who finished fourth at last season’s national championship in Cleveland, sits in eighth place going into the free with 59.24 points, following his fall on the triple Axel. He received credit for the quad toe, the only skater other than Mroz to do so, but stumbled on the landing and could not complete the combination. The ladies competition kicks off with the short program at 7 p.m. Saturday. Among the athletes competing with World Champion Yu-Na Kim of Korea are two-time U.S. silver medalist Rachael Flatt, 2008 U.S. Junior Ladies Champion Alexe Gilles and 2006 Olympian Emily Hughes, a last minute replacement for injured Olympic silver medalist Sasha Cohen. The original dance and the pairs free skate kick of the action Saturday.